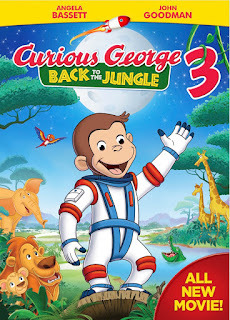 On June 23rd, 2015, Universal Pictures released the new Curious George 3: Back to the Jungle on DVD. With George kind of being a classic in my household, we knew this would be something the boys would love. Declan is always getting into trouble and we've nicknamed him our little monkey so it just seemed fitting that we all enjoy watching this cartoon series as a whole family. The synopsis says " Launch into the adventure of a lifetime with everyone’s favorite monkey in this all-new movie, Curious George 3: Back to the Jungle! When Curious George is asked to take part in a very important space mission, a little monkeying around forces him to crash-land in Africa. While a worried Man with the Yellow Hat searches for him, Curious George bravely explores the jungle and makes new animal friends along the way. Reunited at last, the two best pals have an unforgettable adventure shared with their new friends! Featuring the voice talents of Angela Bassett & John Goodman, with music by the Plain White T’s, join Curious George on his fun-filled journey that the whole family will enjoy!" While I had expected Declan to be into this one the most, Dane thoroughly enjoyed it! The big hit though with this one is the awesome soundtrack as well as the brand new free photo app: www.PhotoWithGeorge.com. We haven't had time to try the app just yet since the DVD just arrived but I can guess it will be quite a bit of fun for the boys if we can take selfies with George! Recommendation: Both boys seemed to have quite the interest and thought all of different episodes were funny! Declan loved singing to the songs and dancing to the music in this one! I don't know if I'd be willing to pay $20 for the DVD but it was definitely worth the watch! !